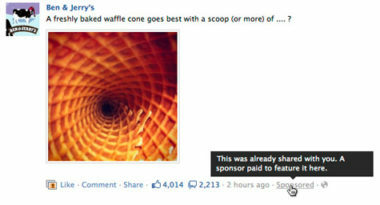 Facebook will begin featuring Sponsored Stories social ads in the main news feed of its Web version in 2012. Only one Sponsored Stories ad will be displayed per day and it will be clearly marked as “sponsored” to distinguish it within the news feed. While there is no way for users to opt out of seeing these sponsored stories or remove their activity from them, Facebook has assured that these stories would only relate to users’ friends or the pages they like. Techcrunch.com recently reported on what this social media move will mean for both advertisers and users. For advertisers, the ability to display promoted content next to regular social content in this widely read news feed will be a dream come true. Their ads will now be positioned directly in front of an enormous audience that is actively engaged in the news feed. In addition, the ads will look similar to regular news feed stories and will only be marked as a sponsored ad in the bottom right corner, which happens to be the last place that a user’s eyes go. The result is that users won’t even realize they’ve processed an ad until after the fact. Advertisers realize the incredible value of this opportunity to be boldly positioned alongside sought-after social content. Facebook expects that some users will object to this promotional addition to the news feed and the site’s blatant attempt to profit from users’ content. Yet the social network also believes that many will feel Facebook has the right to place ads anywhere it wants, especially since the site provides a free service that so many people value. For now, upholding the planned ad limitation of one per day will be essential to maintaining a quality user experience. If Facebook exceeds that rate, users may start regarding the news feed as an endless commercial stream and turn away from the site altogether. This is not the first time that Facebook has featured sponsored ads in its news feed. In 2006, the site started testing this option but ultimately discontinued it in 2008. Afterwards, all ads were restricted to a small sidebar on the right side of the interface. With the launch of Sponsored Stories in early 2011, advertisers started paying to transform the news feed stories generated by user interactions into ads. By fall of 2011, Sponsored Stories were appearing in the Ticker for the first time since 2008. Users didn’t seem to mind the inclusion of these ads, which bolstered Facebook’s confidence enough to announce their plan to start regularly including Sponsored Stories in the main news feed in 2012. Facebook has approximately 400 million daily users, with half viewing the Web version of the site. This means that there is potential for the daily ad inventory to rise up to 200 million impressions each day. This inventory explosion could result in a reduction in ad prices or, conversely, raise them in response to increased advertiser demand for Sponsored Stories. Once Facebook gets through the initial user reaction to Sponsored Stories being included in the main news feed, it will have created an extremely lucrative revenue stream that could revolutionize online advertising and change the social media experience forever. To discover innovative ways to add Facebook advertising to your marketing mix, contact MDG Advertising.